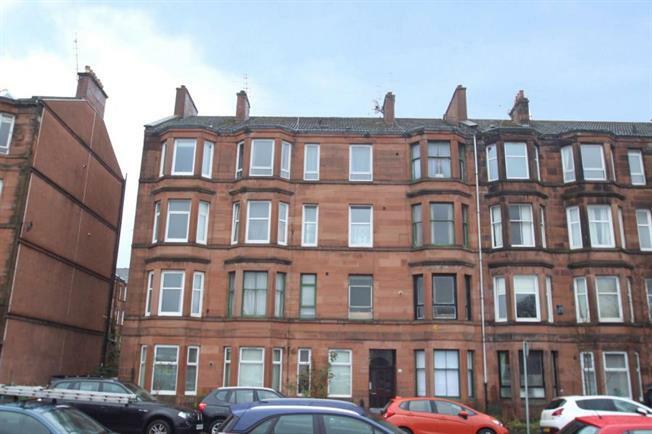 2 Bedroom Upper Floor Flat For Sale in Glasgow for Offers Over £85,000. Set within a Red Sandstone traditional tenement building just off Pollockshaws Road, this two bedroom flat enjoys a second floor postion and is ideal for first time buyers,investors and downsizers alike. Accommodation comprises welcoming hallway, great size bay windowed lounge with open aspects, internal kitchen, two rear facing double bedrooms and three piece bathroom. Features of the flat includes double glazing,gas central heating and communal gardens to rear. Early viewing is strongly advised. The flat is ideally placed for access to both Strathbungo and Shawlands which offer a superb variety of amenities including restaurants, bars and recreational facilities. There are transport facilities which include bus and rail links providing access to Glasgow city centre and surrounding areas. Motorway access is also located close by.